A couple of weeks ago I was planning on having a naming contest for the then as yet unnamed tornado project. UTP sounded like an infection, and my control freak wanted to come with a remedy. But alas, the makers of the film have decided it shall be ‘Black Sky,’ which does sound interesting. Not to be defeated, I’ve decided to have a contest for a tagline for said ‘Black Sky.’ Just for fun. It’s not on yet but hopefully soon. Do I need a fake fan letter to Todd? Oh, yeah. You have been so much fun. Thank you for that! This letter is to also tell you how much I would love to change the picture above to an RA signed ‘Black Sky’ t-shirt or poster. I’m not picky. And I was even willing to ask openly with the possibility of your thinking I’m a nut. Well, I am a nut, but damn man, it’s fun. Off to talk to WB. 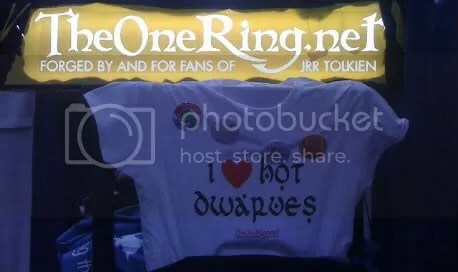 T-shirt courtesy of the lovely people at TheOneRingnet. “UTP sounded like an infection” AHAHAHAHHAHAHHAHA!!!!!!!!!!!!!!!! Cool! I’ve got some ideas for a tag line already. Tell Todd Garner to tell RA to get a twitter account and show him how to use it!!!! Or banned an ip. Not sure I can always say that, but I can still say it after 2+ years.